The competition in the high-end electric shavers segment is fierce, with the three big names in the industry — Braun, Philips Norelco and Panasonic — offering some fantastic products. Braun’s range-topping line is the Series 9, Philips Norelco has the Series 9000 Prestige, while Panasonic wants to take the first spot with its Arc 5 family of electric shavers. Launched back in 2009, the Arc 5 line is currently at the third generation and almost all the different models are still widely available. In this review we’ll take a close look at what I consider to be the most compelling of all Arc 5 variations, the Panasonic ES-LV65-S from the second generation. Choosing a suitable shaver can be difficult with all the different products, variations and conflicting information regarding which one would be a better fit for you. Since the Panasonic ES-LV65-S has quite a lot going on, this is going to be a very comprehensive article that’ll cover every important aspect of this particular model, including shaving performance, the good and the bad parts, how it compares to other Arc 5 variations and, of course, its direct competitors. Wrapup – who should buy it? As usual, we’ll kick off our Panasonic ES-LV65-S review with a quick look over the main features, without getting too hung up on the technical specs and marketing fluff. 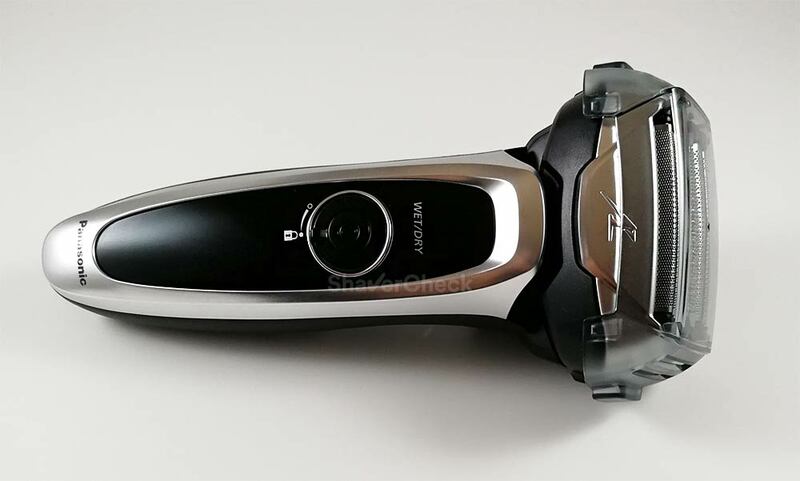 Being part of Panasonic’s Arc 5 family of shavers, the ES-LV65-S exhibits the defining characteristics of this line: an arched profile of the foils (hence the Arc name) and a whopping 5 blade shaving head. It’s worth mentioning that the Arc 5 is currently the only line of foil shavers that has 5 individual cutting elements. As a side note, Braun tried suggesting that its Series 9 also has 5 cutting elements, but that’s just downright false. So we have 5 cutters that form a massive shaving head. Excessive? Maybe. We’ll see how this translates into the actual shaving performance later on. The idea behind a multiple blade shaving system is to reduce the time it takes to complete a shave and to have specially designed cutters for tackling short, long and flat-lying hairs. 1. Two finishing foils. These are the outermost shaving elements and are responsible for cutting short stubble very close to the skin. 2. Two reverse tapered foils called Lift Tech foils that supposedly lift and cut hairs that grow parallel to the skin. These two foils flank the middle trimmer. 3. One slit blade. This middle trimmer has specially designed slots for capturing longer hairs and cutting them down to size; the hairs are then cut at skin level by the other cutters. The blades that oscillate behind the foils and do the actual cutting are Panasonic’s well-known 30 degrees nano-blades. Despite the marketing terminology, these blades really are fantastic. They’re used throughout the entire Panasonic range of shavers, even on the entry level Arc 3 models and contribute to making them the closest shaving shavers in their respective class. What makes these blades unique is the aggressive 30 degrees bevel that allows them to cut the hairs clean and efficiently. Just like with the Arc 3 and Arc 4, there are only 2 inner removable blades. For the ES-LV65-S the inner blades correspond to the reverse tapered foils. The other 3 are integrated into the foil assembly itself. The Panasonic ES-LV65-S is equipped with the fastest motor on any electric shaver, a unit capable of delivering 14 000 CPM (cycles per minute). As a comparison, the Series 9 from Braun has a 10 000 CPM motor. 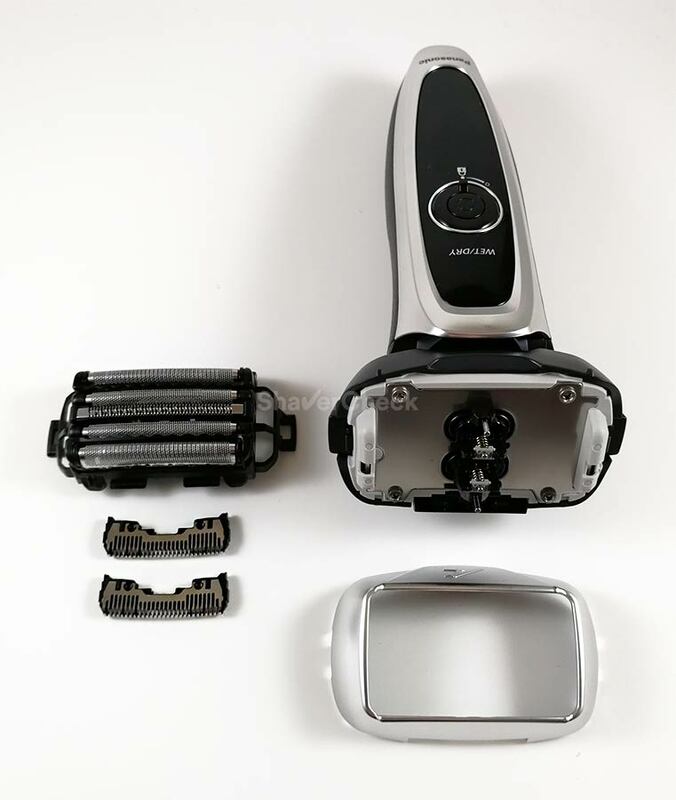 Of course, speed isn’t everything, but this is a beast of a motor and contributes massively to the shaving performance of Panasonic’s Arc 5 shavers. 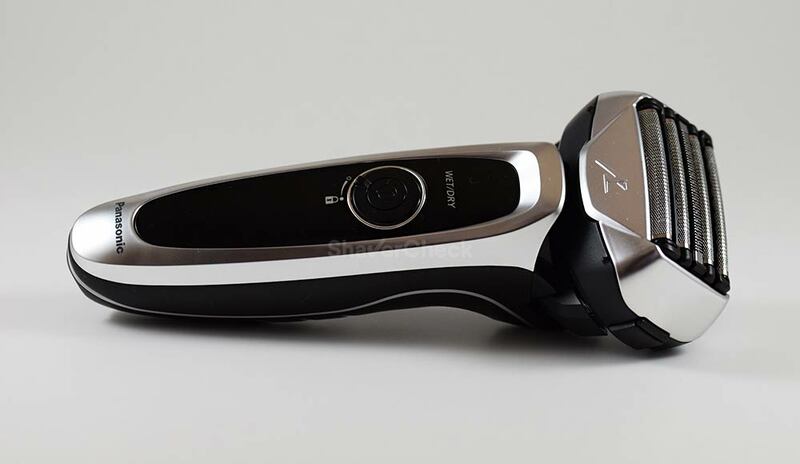 The ES-LV65-S features a technology seen on other high-end models as well that allows the shaver to read the beard density and adjust the power output accordingly. 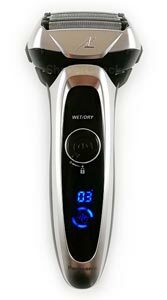 You can use the ES-LV65-S with the sensor technology enabled or you can disable it altogether and get full power for the entire shaving session. I tested the shaver both ways and I’ll share my thoughts later on in the performance section. All the advanced electric razors have some sort of flexing/pivoting capabilities that help with maintaining contact with the skin. The third generation Arc 5 probably has the most advanced shaving head of any foil razor with regards to flexing and pivoting, but the ES-LV65-S is not too bad either. While it lacks the ability to be depressed, the shaving head of the ES-LV65-S can pivot back and forth and also from left to right. The motion is buttery smooth and works very well during use. The head can also be locked in a fixed position when more precision is required. Like all modern Panasonic electric shavers, the ES-LV65-S Arc 5 can be used both wet & dry (you cannot shave when the razor is plugged in and charging though). Being fully waterproof, you can shave in the shower, use it with your favorite shaving cream and easily clean it with water. Other noteworthy features of the ES-LV65-S include: 45 minutes cordless operation, pop-up trimmer, LED display, travel lock, 100-240V (Automatic International Dual Voltage Conversion). Upon taking a first glance at the ES-LV65-S I immediately noticed that it doesn’t look as flashy as the official photos might suggest. And depending on your preferences, that may be a good or a bad thing. I personally think that it’s one of the better-looking shavers out there. I like the elegant silver and black color scheme that works great with its modern design. Despite being launched in 2013, the ES-LV65-S looks very up to date. Design-wise, it’s definitely a go from me. On the front of the shaver there’s a glossy black fascia that surrounds the controls and the LED display. Around that glossy black surface there’s a silver trim that has a matte finish, which I definitely prefer. The ON/OFF button is fairly small in size and has a very short travel, but it’s very clicky and responsive. There’s a locking ring surrounding the power button that has two positions. 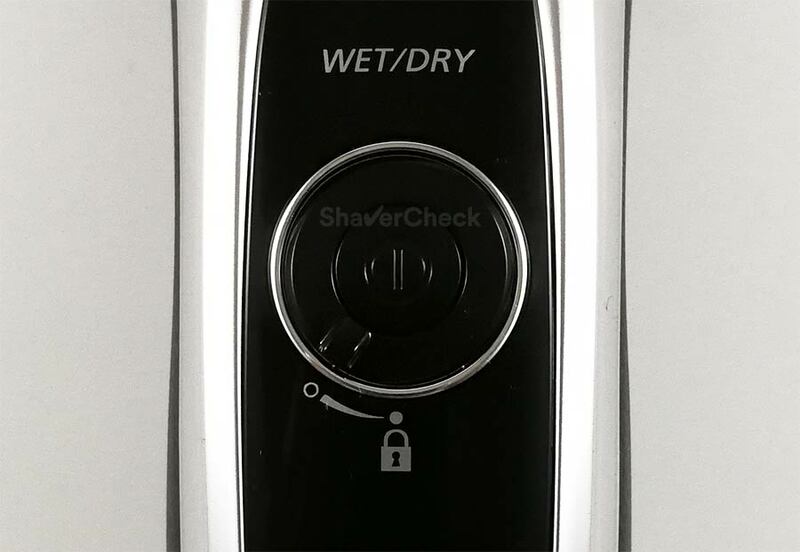 Aligning the small knob with the padlock will lock the ON/OFF button, making it impossible to turn the shaver on by accident. Rotating the ring clockwise will unlock the power button. This is a simple and convenient implementation that we’ve seen on several Arc 4 and Arc 3 models as well. Below the controls there’s the LED display that shows quite a bit of useful information, including the shave duration, remaining battery, shaving sensor mode, cleaning reminder. It will also show you when it’s time to replace the foils and blades. When pressing the ON/OFF button, the ES-LV65-S will always start with the shaving sensor enabled, signaled by the blinking of the corresponding icon. The ES-LV65-S turned on with the shaving sensor activated. When shaving in sensor mode, the icon will blink throughout your entire shaving session. 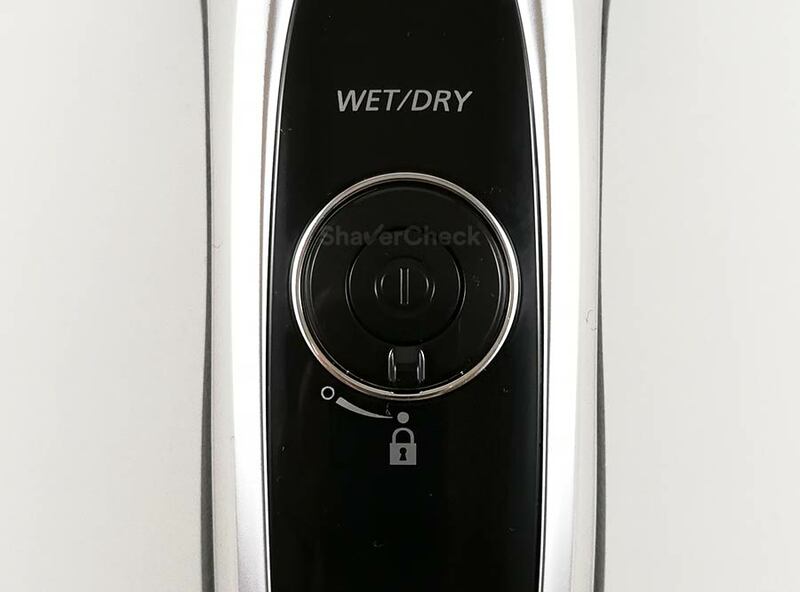 To disable the sensor mode and shave with full power the whole time, simply press again the ON/OFF button when the shaver is turned on in sensor mode. This will deactivate the sensor, signaled by turning off the icon. You can also hear this as the pitch of the sound will slightly increase. The sides are made of a lightly textured, but extremely grippy material that extends to the back of the shaver as well. It provides a very secure grip, even when the shaver is wet or covered in foam. The back of the ES-LV65-S definitely has more things going on compared to most other shavers. Starting from the top, we have a pop-up trimmer on the shaving head itself that sits perpendicularly when deployed. Below the trimmer you’ll find a switch that has 3 positions. In the first one, the shaving head can pivot and move freely. The second position locks the head, preventing it from any flexing and allowing better control when shaving a tight spot. Finally, the third position activates the pop-up trimmer. Further down you’ll see three round shapes that barely protrude and actually do nothing. They are just blanks and are replaced by metal studs on the ES-LV95-S variation that comes with an automatic cleaning station. On that particular model the metal contacts are used to charge the razor when placed into the station. At the bottom there’s the charging port and as mentioned previously, the shaver can’t be used while plugged in as a safety precaution. The build quality, finishing, and the overall feel are excellent. In fact, I would go as far as saying that Panasonic currently offers the best build quality out of all electric shaver manufacturers. The latest Arc 5 iteration with models like ES-LV9N have taken this to the next level and feature a brushed metal body. However, the ES-LV65-S is still impressive, particularly when compared to the plasticky Series 9. Everything feels sturdy and well built, with the foil frame and protective cap snapping easily and securely into place. When it comes to ergonomics, The ES-LV65-S scores very high as well, despite the large shaving head that may take some getting used to. The sculpted profile of the body makes it very comfortable to hold. At 6.9oz (195 grams), the Panasonic ES-LV65-S is surprisingly light. Despite the massive appearance of the shaving head, it’s very well balanced. I was expecting the shaver to be top heavy, but it’s actually not. The construction and craftsmanship of the massive shaving head are something to behold. Overall, the Panasonic ES-LV65-S gets almost everything right with regards to build quality and ergonomics. As you can see, the bundle is pretty extensive and covers just about everything. I am particularly pleased with the inclusion of the lubricant, this really should be standard with any electric shaver that doesn’t come with a cleaning station. 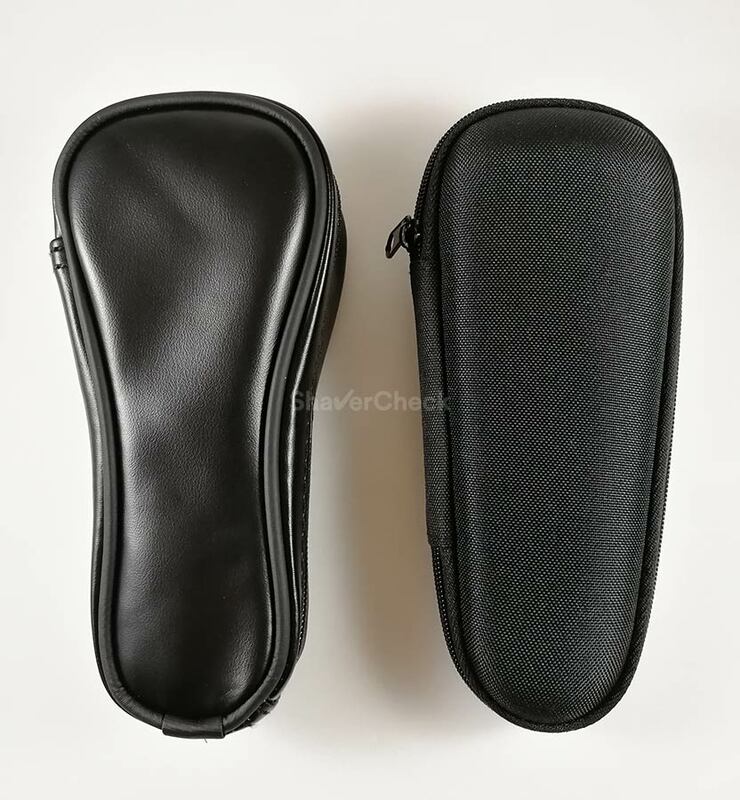 The travel case looks good and it’s definitely welcome, but unfortunately it’s made out of the same faux leather material that offers limited protection compared to the hard travel case used by Braun for example. The travel case included with the ES-LV65-S (left) vs the one shipped by Braun with the Series 5, 7 and 9 (right). But unlike Braun, Panasonic also includes a plastic cap that covers the very sensitive foils, so we can let this one slide. 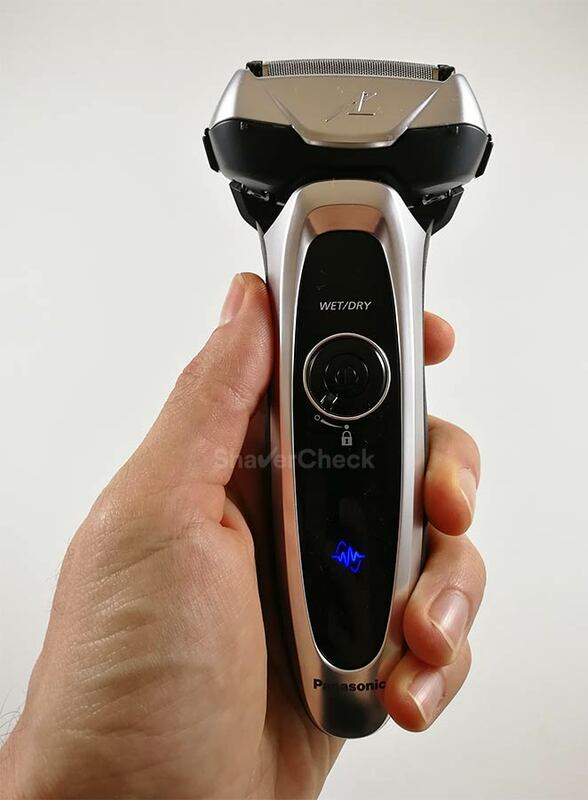 The Panasonic ES-LV65-S has a built-in rechargeable Li-ion battery and can only be operated cordless, meaning you won’t be able to shave with the razor plugged in. This is a safety precaution since the ES-LV65-S is suitable for wet & dry use. The battery life of this shaver is excellent. Panasonic says that you’ll get around 45 minutes of shaving time from a fully charged battery and that’s actually pretty accurate. Another good thing is that the motor can operate at peak power even when the battery is almost depleted, with no significant drop in performance. The battery capacity lamp will show you in percentages the remaining battery charge. Right below there’s a graphic element that depicts the same thing using a circle comprised of 6 segments. All the segments apart from the bottom one represent 20% of the battery charge. The bottom segment is only used to signal a low battery by blinking when the charge drops below 10%. You’ll still be able to complete one or two shaves in this situation. With the shaver turned on, instead of the battery percentage, the display will show you the elapsed time since you started your shaving session. The elapsed time and battery capacity are only shown for 5 seconds once you start the shaver and are then turned off. After you’ve finished shaving and stop the shaver, the lamps will light up again and turn off after 8 seconds. This timer is actually pretty useful in helping you get an idea of how long it takes you to shave and you can for example compare how different changes in your technique actually help you shave faster. Charging the ES-LV65-S from 0 to 100% takes a little less than one hour. During this time the corresponding charging lamp will glow continuously. While charging, the battery percentage lamp will increase from 0 to 100%. The charging brick is fitted with an automatic voltage converter, allowing it to adapt to any voltage between 100 and 240v. Depending on where you buy it, the charging cord of the Panasonic ES-LV65-S can come with a USA or a European plug. All right, let’s now get to what really matters: how well does the Panasonic ES-LV65-S shave? Apart from a couple of gotchas, this is without a doubt one of the best electric shavers you can currently buy and it doesn’t have a prohibitive price either. No, it’s not the latest Arc 5 model anymore, but trust me, the ES-LV65-S is a beast of a shaver. This wasn’t the first time I’ve used an Arc 5, so the results of this review didn’t really come as a surprise to me. Different men want different things from an electric shaver, a close shave being among the priorities. If closeness is particularly important to you, the Panasonic ES-LV65-S should be on the top of your list. On paper things look very good for this model: powerful motor, sharp blades and a high-quality shaving head. Luckily, these features also translate into a stellar real-world performance as the shaver manages to provide an impressively close shave. I would go as far as saying that this is probably the closest shaving electric razor I’ve ever used. I happen to have two problem areas, with very dense and coarse hair — right above my upper lip and on my chin — and most electric shavers fail to provide a very close shave. The Panasonic ES-LV65-S manages to get closer than pretty much all the shavers I’ve tested so far. In fact, when using it with shaving cream the results are on par with what I would get from a razor blade (minus the rashes and nicks). I also noticed that when I shave with ES-LV65-S it takes longer for my beard to grow and to actually feel the stubble when I run my fingers over the skin. I can only blame this on the fantastic closeness of the shave. Compared to other high-end shavers like the Braun Series 9 or Philips Norelco Series 9000/S9000 Prestige, the ES-LV65-S comes on top when it comes strictly to the closeness of the shave. A welcome side effect of having a powerful motor and a massive shaving head is speed. Completing a shave with the ES-LV65-S, especially when shaving a shorter beard, takes less time compared to most other shavers. Even in the case of very coarse facial hair, this razor will be fast and effortless to use. With certain shavers I would sometimes notice a change in the sound during use, vibrations and even get the feeling that the razor is struggling. Not a hint of that with this one, it just mows through the stubble with ease. And speaking of sound, the ES-LV65-S is reasonably quiet for a foil shaver fitted with a powerful motor. It’s definitely quieter and more refined compared to my ES-LA63-S Arc 4 shaver. It’s still nowhere near as quiet as a rotary shaver, but that’s to be expected. Panasonic shavers usually edge the competition for sheer power and closeness, regardless if we’re talking about high-end models like the Arc 5 or entry-level Arc 3 razors. However, things aren’t always that good when it comes to comfort. Because of the extremely close shaves, Panasonics can be a bit aggressive, especially if you suffer from sensitive skin like myself. I’ve experienced this with several Arc 3 and Arc 4 models. What made things worse was that the foils and particularly the slit trimmers would get really hot after a few minutes of use. I was very surprised that despite having a similar shaving system, the ES-LV65-S actually remained reasonably cool even after an extended shaving session. At least in my case, this vastly improved the comfort compared to other Panasonic models. No, it’s still not as comfortable and smooth as a Braun Series 9 which is in my opinion the most forgiving and gentle shaver out there, but if you don’t have very sensitive skin I think you should be just fine using the ES-LV65-S.
Just make sure not to apply too much pressure as it will definitely let you know. Adding a pre-shave lotion will also help in this case. All Panasonic shavers are suitable for wet & dry use. You can shave in the shower or with your shaving cream of choice if you’re into that. I personally enjoy wet shaving quite a bit and I don’t mind spending more time on prep work and cleaning. I usually get a closer and more comfortable shave doing so. In my experience, Panasonic electric shavers work better than any other brand when used with shaving cream. The ES-LV65-S is a joy to use in this manner and the addition of a quality shaving cream makes it very comfortable, definitely suitable for sensitive skin. Most men that will end up buying this shaver will probably be using it dry for the convenience, but it’s useful to know that you can further improve the comfort if you have very sensitive skin. Longer, flat-lying hairs often pose a problem for most electric shavers, particularly the basic ones. And this seems to affect foil shavers to a higher degree. The Panasonic ES-LV65-S is definitely not a basic shaver and most of the time it deals pretty well with longer hairs. However, when it comes to hairs that lie flat on the skin it does struggle a bit and requires more strokes to capture them. Despite fitting the shaving head with the so-called reverse tapered edges foil, it’s just not as good as the Series 9 from Braun when shaving longer hairs that grow parallel to the skin and in different directions. If you shave often this won’t be a problem, but if your routine implies shaving every two to three days or more and you have wiry, flat hairs, the ES-LV65-S will require more effort on your side to get all the hairs. In this case you should take a look at the Braun Series 9 or the Philips Norelco Series 9000 which are arguably better at shaving longer, flat-lying hairs. Having used the latest Arc 5 with the redesigned foils that are supposedly better in this regard, I can honestly tell you that they’re not. So in my opinion that’s a not a valid reason to consider them over the ES-LV65-S.
One of the most intriguing features of the Panasonic ES-LV65-S has to be the shaving sensor that supposedly detects the beard density and adjusts the power output accordingly. I’ve used other shavers in the past that had similar technologies, one of them being the Series 7 with its personalization modes. To be perfectly honest, none of the different implementations managed to improve the actual results to a significant degree and it’s the same story here. 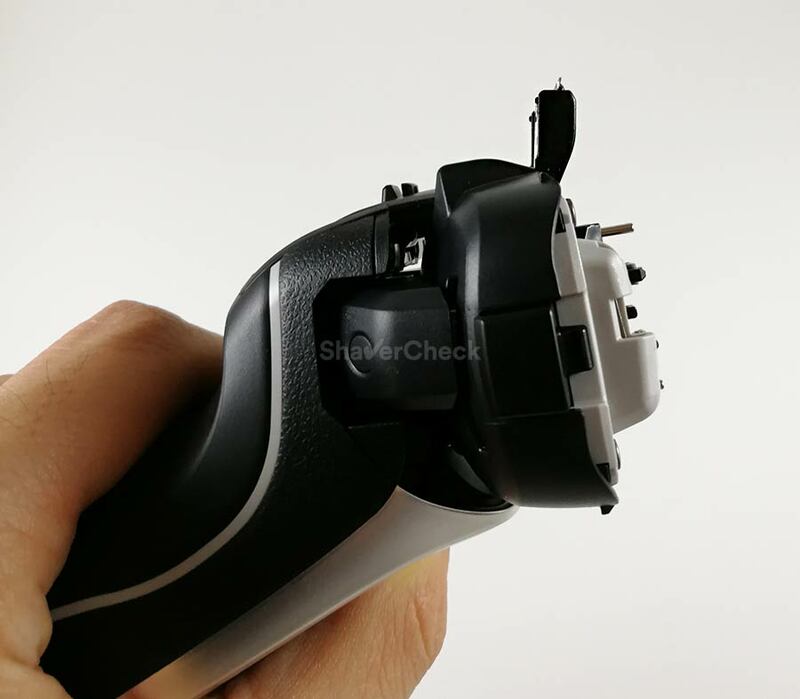 When you first turn on the ES-LV65-S by pressing the power button the shaver will automatically start in sensor mode. This is also signaled by the blinking of the corresponding lamp on the LED display. 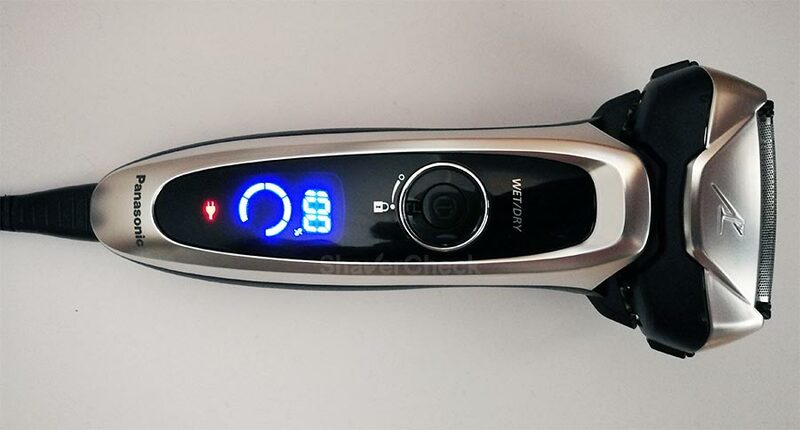 With the shaver turned on in sensor mode, pressing the power button one more time will deactivate the sensor and the razor will run in full throttle mode. Upon deactivating the sensor the lamp will turn off and you’ll also notice a slight increase in the sound, signaling the fact that the motor is running at the highest output. The sensor really works, meaning you can actually hear the shaver adjusting. But in terms of closeness, speed or comfort there isn’t really any difference. In fact, I’ll argue that having full power for your entire shave can only be beneficial to your results. After testing both settings I always chose to deactivate the sensor and simply shave in normal mode. I consider these hair trimmers to be extremely useful for touch-ups and light grooming; however, on many occasions, their design and implementation leave much to be desired. The placement, width, and sharpness are often screwed up by the manufacturers. With Panasonic shavers the placement is usually the culprit, the trimmer being obscured by the massive heads. Luckily, the trimmer on the ES-LV65-S is positioned quite well. Firstly, despite the large surface of the 5 blade shaving system, the head is actually not that tall and the trimmer sits pretty close to the top. Secondly, if you remove the foil frame and the two inner blades, you actually end up with a perfect setup with the trimmer not being obscured at all. With the foils and blades removed, using the trimmer of the ES-LV65-S is a breeze. It’s probably not optimal to use it for trimming your entire beard, but for shaping your sideburns or goatee it works great. It’s adequately wide and sharp, cutting the hairs very efficiently and I never experienced any pulling or pinching. In conclusion, the shaving performance of the Panasonic ES-LV65-S Arc 5 — particularly the closeness — is top notch. Part of the second generation Arc 5 line, the Panasonic ES-LV65-S is a model that doesn’t include an automatic cleaning and charging station. And in all honesty, you really don’t need one despite the fact that Panasonic’s cleaning stations are excellent (reasonably fast and with lower running costs compared to Braun for example). I say this simply because the ES-LV65-S is very easy to clean and it really takes less than a minute to do it. If you absolutely must have the station, then you can opt for the Panasonic ES-LV95-S which is identical to the ES-LV65-S reviewed here but it also includes an automatic cleaning base. It is fully waterproof and can be easily rinsed under tap water. The design of the shaving head offers generous access to clean the foils on the inside. The two inner blades are completely exposed and can be cleaned thoroughly. The sonic cleaning mode makes the blades vibrate extremely fast (17 000 CPM compared to the usual 14 000 CPM) and dislodges any traces of dirt. I usually opt for Panasonic shavers that don’t include a cleaning station and I actually recommend you to do the same. Again, they’re dead easy to clean and you’ll also be saving some money as the shavers themselves cost less and you won’t have to buy the cleaning detergent. Let’s see how to clean the Panasonic ES-LV65-S efficiently and fast. Once you’ve finished shaving, remove the foil frame and gently tap it on the edge of your sink to get rid of most of the hairs. Snap the foils back on to the shaver, pour a little liquid soap on the foils, add some water and press and hold the ON/OFF button for more than 2 seconds. This will activate the cleaning mode. After 20 seconds, the shaver will automatically turn off. You can also turn it off earlier by pressing the ON/OFF button. Remove the outer foils again and press the power button for more than two seconds. When the shaver starts in the cleaning mode, rinse the inner blades under running water. Wash the foil assembly with water as well, both the inside and the outside. Shake off any excess water, then gently pat dry with a cloth. That’s it. There’s also a cleaning brush included that you can use to remove the hairs, but I highly recommend the method described above. To prolong the lifespan of the foils and blades, you should lubricate them regularly using the included oil. This is particularly important if you use liquid soap to clean your shaver as that removes any traces of lubrication from the blades. With the ES-LV65-S, performing this operation is as easy as putting a single drop of lubricant on each foil. You then let the shaver run for a few seconds, turn it off, then gently pat the foils with a paper towel to absorb any excess oil. You can read more about the importance of lubricating your razor here. The ES-LV65-S uses Panasonic’s WES9032P foil & blade replacement combo. The same part was used by the first generation Arc 5 shavers like the ES-LV61-A. It’s widely available and can also be bought online. The foil and blade combo is a bit pricey, especially when compared to the direct competitor of the Arc 5 line, the Braun Series 9. Panasonic recommends replacing the outer foil every year, while the two inner blades should be changed every two years. In reality this is highly dependent on how you use your device and how coarse is your beard. Cleaning your ES-LV65-S after every use and lubricating it regularly will increase the life of the foils and blades. Bonus tip: you can use the foils and blades of the latest Arc 5 generation on the ES-LV65-S and ES-LV95-S as well. The part numbers for those are WES9034P and WES9036. The new Arc 5 foils and blades with the distinctive golden comfort rollers. Compared to the WES9032P that is fitted to the ES-LV65-S, the new foils are more comfortable. In my experience the closeness was pretty much the same. Changing these parts is very easy; the inner blades can be removed by grabbing them by the extremities and simply pulling them out. Make sure to grab them by the ends as the blades are very sharp. The foil assembly can be removed from the frame by pressing the two side tabs and pushing it in. The LED display will also remind you when it’s time to replace the foils & blades by showing a check lamp about once a year. The Panasonic ES-LV65-S Arc 5 is one of the highest rated electric shavers out there and for good reason — it really is a fantastic product. I can think of very few scenarios where you should overlook the Panasonic ES-LV65-S, so I’ll just get them out of the way. If you have very sensitive skin that is prone to ingrown hairs and razor bumps, you should probably check out one of Braun’s top shavers like the Series 7 and 9 (more details in the next section). 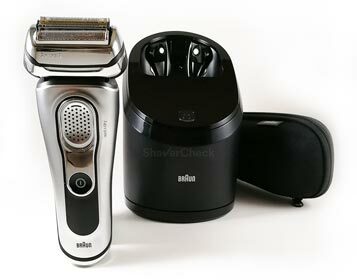 Also, if you shave every two to three days or more and your facial hair is wiry, grows parallel to the skin and in different directions, again a Braun Series 9 would probably be a better option or even a rotary razor like the Philips Norelco 9300 or S9000 Prestige. And that’s pretty much it. If your budget allows it, the ES-LV65-S is one of the best electric shavers out there, especially if you want a very close shave. 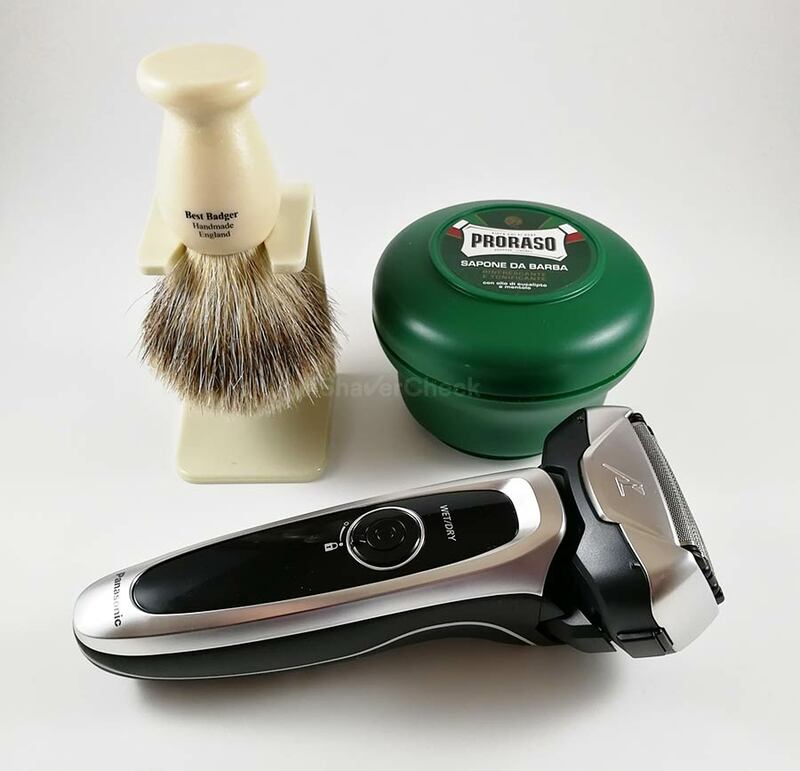 In this regard the ES-LV65-S is only edged by the latest Arc 5 models like the Panasonic ES-LV9N and mainly because the newer foils are more comfortable, allowing a more thorough shave. However, the price of those shavers is still extremely high and I don’t think it’s worth spending that much money for an incremental improvement in performance. 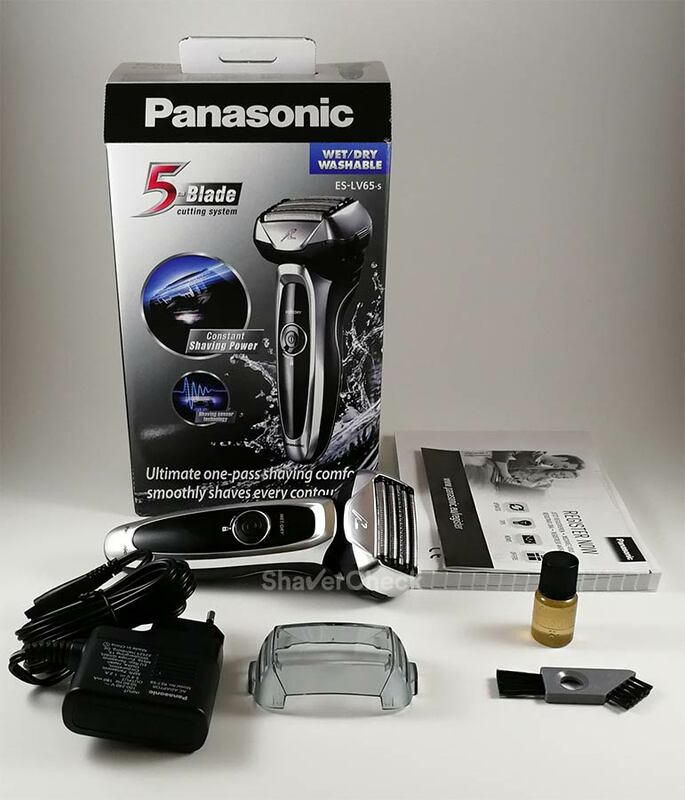 If you have very coarse facial hair and want a very fast, powerful electric shaver that is able to get you extremely close shaves while still being adequately comfortable, then you should strongly consider the Panasonic ES-LV65-S. It can often be found at an excellent price; in fact, it’s usually priced lower than a Braun Series 7. And while the Series 7 is more comfortable out of the box, the ES-LV65-S is more powerful, shaves closer and it is a lot easier to clean manually. The first obvious alternative to the Panasonic ES-LV65-S would be its close relative, the ES-LV95-S.
As mentioned previously, this is an identical razor except that it comes with a cleaning and charging base. Along with this second generation Arc 5, Panasonic also introduced the updated cleaning and charging stations. The most important changes regarding the new stations are the use of concentrated detergent packs instead of cartridges, a more compact design of the station and some performance improvements. As a result, the cleaning base included with the ES-LV95-S is really good and the costs per cleaning are lower compared to Braun. The detergent sachets are cheaper and the cleaning solution that results from mixing the detergent with water tends to last more than Braun’s alcohol based cleaning fluid. However, as I said earlier, you don’t really need a cleaning station with the ES-LV65-S, but if you still want it, the ES-LV95-S is the one to have. The Arc 5 is Panasonic’s most advanced line of electric shavers and it’s only natural to put it against Braun’s best shaver, the Series 9. 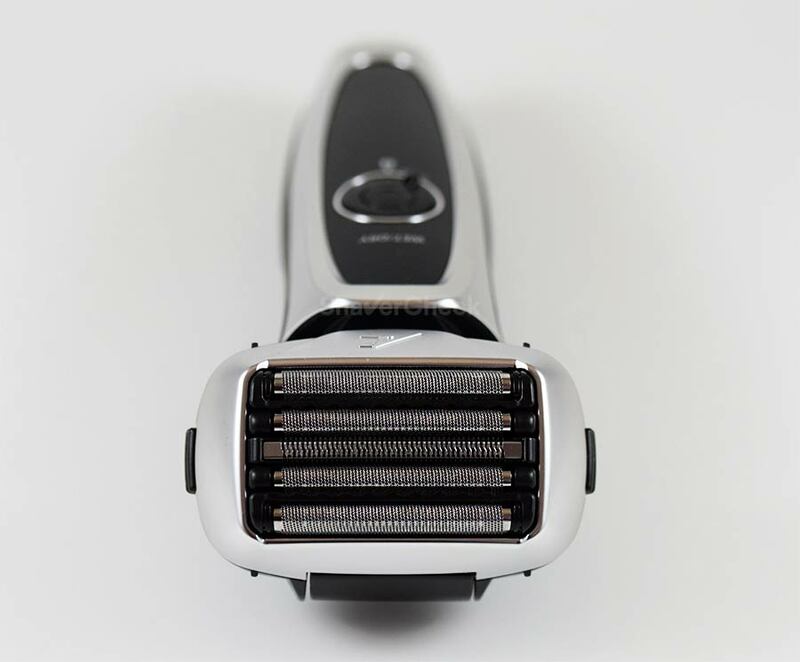 In terms of value for money and closeness of the shave, the Arc 5 has the edge. However, where the Series 9 really shines is the comfort and also when shaving longer, flat-lying hairs that grow in different directions. The design of the Series 9 shaving head, with the two specialized trimmers that capture longer, wiry hairs, makes the Series 9 one of the best foil shavers out there for these situations. So if you have very sensitive skin or tend to shave every two days or even more, the Series 9 would likely be a better choice. My recommendation would be the Braun 9290cc from the updated Series 9 line as it generally costs less than other Series 9 variations and also comes with a cleaning station. Unlike Panasonic, Braun razors are more difficult to clean manually, so I would actually recommend you to opt for a cc model that includes a cleaning base. Keep in mind that the Series 9 shavers usually cost more than the ES-LV65-S, even the models that don’t include the cleaning station like the 9293s. Also, while the Series 9 shavers are supremely comfortable, they don’t shave as close as the ES-LV65-S. Finally, a more budget-friendly alternative to the ES-LV65-S would be a personal favorite of mine, the Panasonic LA63-S from the Arc 4 line. 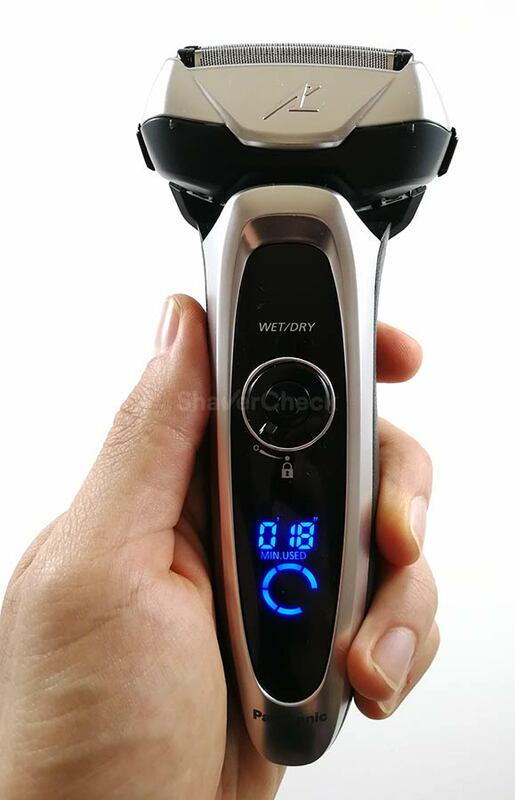 Even if it has less cutting elements, 4 blades are still easily enough and in conjunction with the same powerful 14 000 CPM motor and sharp 30 degrees blades, the ES-LA63-S is in my opinion one of the best electric shavers in its price range. Just like the ES-LV65-S, it’s dead easy to clean manually, so you don’t really need the cleaning station (available with the ES-LA93-K version). Performance-wise, it’s able to provide very close shaves, it’s fast and adequately comfortable. Overall I would say that it’s quite similar to the ES-LV65-S, though not quite as refined and comfortable. For most men the ES-LA63-S Arc 4 would be more than suitable. The shaver itself is reasonably priced and the replacement foils and blades are also slightly cheaper compared to the ones needed for the ES-LV65-S.
At a age of 47 I finally found a razor that works with my facial hair. Using blades is a carnage that is painful and my face looks like a piece of swollen raw meat. Everytime I have asked in shops for a electrical shaver I have been recommend using Philips, and lots of “Top 5” tests in magazines also saying this – but to be honest they are crap. I thought that if Philips is the best razor I am just not a person thst have a to clean shave. The last 15 years I have used a trimmer and accept the the look of 2 day stubbles. My face looks okay in this way, but there will always be times, for example when dressed in a suit, where I feel like a hobo when not having a clean shave. Thank you for taking the time to share your experience in such great detail. I’m glad to hear that you’re enjoying your shaves with the Panny. 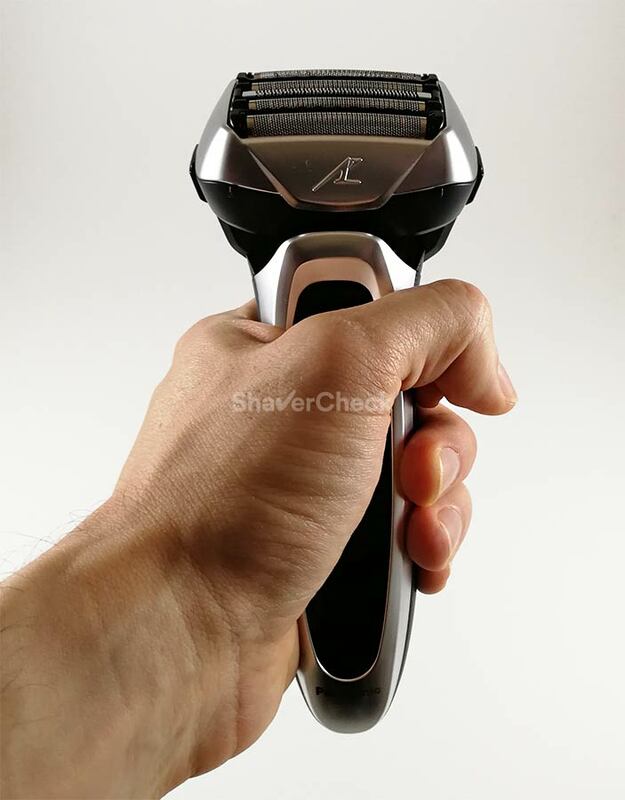 Thanks for your great and detailed report on this shaver,has put my mind at rest having just ordered one on line, 5 star details from this review, thanks. I’m glad to hear that. I hope you’ll enjoy your shave with the ES-LV65-S. I always read your reviews because they are really very detailed and thorough. I’m very undecided between the LV65 and LA63 with or w/o cleaning station. I live in Italy and I’m currently using a Philips series 7000 with cleaning station – now its two years – and want to try something faster and ‘stronger’ like the Panasonic Arc 4 or Arc 5 series. Here the price is very high so i will get it from the USA. which one would you recommend for a close shave as a whole (under chin and neck) since I already have the Philips 7000? Is the cleaning station of the LA63 the new one? Thank you for being a regular reader of this website, I really appreciate it. I own both the ES-LA63-S and the ES-LV65-S and they are excellent shavers. Both performed similarly when shaving my neck and right under the chin, however the ES-LV65-S did manage to get me a closer shave on the area right above my upper lip where I have particularly thick and dense stubble. I would say that overall the ES-LV65-S feels more refined and offers a slightly closer shave, but again, the difference wasn’t significant. The Arc 4 variation that comes with a cleaning station is the ES-LA93-K. 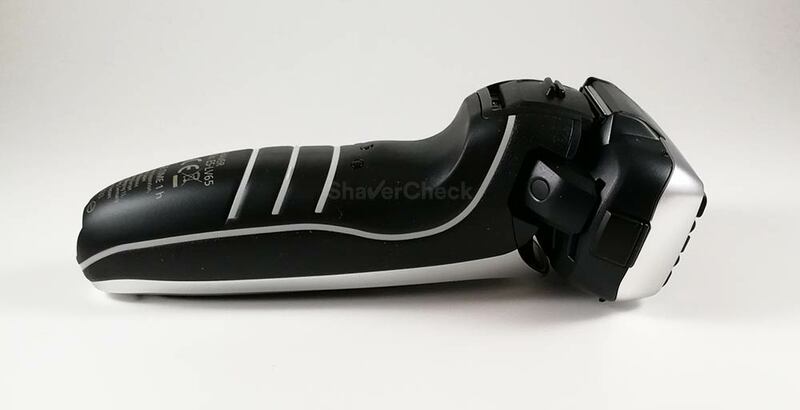 The shaver is identical to the ES-LA63-S, only that it comes in black. The cleaning station is the older Vortex Hydra model. The new one is available only with the Arc 5 (model name is ES-LV95-S). The cleaning stations work very well, but I personally never felt the need for one with any of the Panasonics that I’ve used. If skipping the station means saving a lot of money then you probably should. At least that’s what I would do. thanks for your quick and kind reply. I was leaning towards the Braun series 5, maybe because of brand name, but I’ll give Panasonic a try. I think I’ll get the ES-LV65-S because having the Philips series 7000 I think it’s the best option otherwise it would be something like an overlap; so why not try the top? Thank you very much for this nice and detailed review. I would like to know whether I should go for the LV6N or stick to the second generation LV65. Where I live the difference in price is around 50 euros, however I’ve also seen that the blades replacement is around 70 euros for the LV6N and while for the LV65 is around 45 euros. Thank you for your comment, I really appreciate it. I’ve been asked this question quite a few times and almost always the LV65 makes more sense. But that’s mainly because the price difference between the two is usually huge. However, for 50 euros more I would personally opt for the LV6N. The build quality is outstanding and the performance is also slightly better compared to the previous generation Arc 5. I know that the blades & foils combos are still expensive, but the price will undoubtedly go down as time passes. I forgot to ask if you can can buy the cleaning station later if you need it and the Panasonic ES-LV65-S will work with it. I know that with the Braun razors this is not possible. I’m so glad I discovered your site via Twitter. I’ve been procrastinating on an electric shaver forever, and your review gave me the confidence to buy the Arc5. It’s Day 4, so it’s early, but so far so good. I’m already shaving everyday vs. every other day, as with the razor. Any additional advice on cleaning and maintaining my Arc5? How often do you clean your Arc5 using liquid soap? Do you rinse it after every use? Thank you for your comment and for being a reader of this site. Regarding your question, it really depends on how you shave. For example, I almost always use shaving cream with my Panasonic shavers, at least when I’m not reviewing them. As a result, I must clean them with liquid soap and water after every use. Dried lather can be a pain to remove later on — I’ve learned this the hard way. However, if you shave dry then you can use the brush to remove the hairs or simply rinse it with hot tap water. I personally wouldn’t clean it this way for more than 2 or 3 times in a row. After that I would use soap for a more thorough cleaning. As a rule of thumb, I also lubricate the foils after every cleaning that involved soap. Hope this helps and that you’re enjoying shaving with your Arc 5! If i want a closer shave for a sensitive skin. Would you recommend the Braun 9290 or the panasonic arc 5 3rd generation. I have read multiple threads about both. Will the panasonic cause irritation??? It’s very difficult to predict how a particular shaver will perform as this can vary from person to person. The 3rd gen Arc 5 is a step up compared to the previous one with regards to comfort, but I would still place the Series 9 on top. To me the Series 9 is the most comfortable shaver you can currently buy and would be my pick for someone with very sensitive skin. The Arc 5 does manage to shave a bit closer in comparison. Unfortunately it’s impossible for me to say if it will cause irritation in your case as this depends on many variables. to me they are both very similar in terms of intensity. However, the noise produced by the ES-LV65-S is more like a high pitched whine, while the Series 9 emits a lower hum. First time I visit your website and I must say your review is very thorough ! I’ve been looking for an electric razor that provides razor-like shave for several months but the issue with my facial hair is that they grow slowly. After 24 hours, I do have a little stubble but it is not much : enough to shave with a manual razor but too short for a cheap/standard electric razor. So basically, I wonder if the ES-LV65-S delivers a very close shave even with a mere light stubble ? Thank you for your comment. Shaving longer hairs is what normally causes problems for most electric razors, so the ES-LV65-S should be more than suitable if not overkill for light, short stubble. In my opinion Panasonic shavers manage to offer a closer shave compared to the competition. This particular model is one of the best in this regard, especially if we consider its price. Newer Arc 5 models are a lot more expensive but only offer a marginal performance improvement. Thank you for your fast and detailled reply. If the ES-LV65-S is overkill, I guess I could settle for an ES-LA63-S ? It is less expensive and ranks just below the ES-LV65-S in the top 5 list of the E.R. that give the closest shave. You are welcome, Mathieu. That one would be a very good option as well and can often be bought at an excellent price. I decided to write a follow-up to my previous comment only now, not earlier, after I have tested the shaver thoroughly. It is an excellent device and I love it. Shaving my rough and coarse facial hair takes me approx. 10-12 minutes altogether – that’s the fastest I’ve EVER gotten, regardless whether I was shaving with a Gillette Fusion ProGlide Flexball cartridge shaver, an Edwin Jagger double-edge razor or my old Philips electric rotary shaver that I’d been using most of my life (it is the Philips that I switched from to try other shaving methods and eventually decided electric is my thing but this time I wanted to try out a “creme de la creme” shaver). When it comes to wet vs. dry, surprisingly wet just doesn’t work for me (and, as you know, I’ve tried every possible method, maybe except a straight razor, but come on :D). I get far better results when I dry shave – wet shaving just makes the Panny’s head slide on my face, nothing more. The only thing Arc 5 could be better at is getting rid of flat hair. I believe Braun Series 9 excels Panasonic at this point, but then again I only have 2-3 really small spots like that on my face (actually on my neck where most people don’t look), so it’s still a win for Panasonic over Braun. However, if someone has flat (or wiry hair) all over their face, they should sacrifice shaving time and closeness over better “problematic” hair removal that Braun guarantees. Other than that, there’s literally nothing to complain about. Hope my comment helps others with their choice, too. Thank you for taking the time to write such a thorough follow-up. I really appreciate it and I’m sure it will be helpful to other potential buyers as well. Having shaved with both the Arc 5 and the Series 9, I must say that the latter is clearly better at getting flat hairs. But as you said, depending on the situation this can be a just a minor issue. The Arc 5 on the other hand shaves closer and also faster (as long as you don’t have lots of long, flat lying-hairs). If you can get better results without shaving cream, that’s even better. I’m glad that the ES-LV95-S proved to be the right choice for you. Congratulations for your review it really help me to choose the best shaver for me. I finally bought the lv-6N that come without the cleaning station at just 20€ more expensive than the lv-65. Can I buy the cleaning station separately later if I want? Will it be compatible? Thank you for your comment, I’m glad you found it helpful. That’s a really great deal you got for the LV6N. Unfortunately you won’t be able to use it with a cleaning station since it lacks the two metal studs on the back that are used to communicate with the station and also for the automatic charging function. You’re welcome! One more thing that I just discovered today, so please forgive me for pestering your comment section but what I’m about to write might prove VERY useful to those in two minds about buying this shaver or the Braun Series 9. Guys, all of you with flat and/or wiry hair: if you just bought Panasonic Arc 5, don’t return it yet! Although I only have a few spots like this on my neck, only today did I discover that setting the shaver into the “LOCK” position (located on the back of the device) and turning the sensor OFF (meaning it’s running at full throttle) when shaving these problematic spots, it makes a big difference, at least in my case because I have these spots clean shaven now. Hope this helps. As for the cleaning station, Ovidiu, you nailed it: it’s awesome. However, and I agree with you again, the traveling case is a bummer – should’ve been a hard one, not a softie. By the way, do you know if I can buy a hard case for the Arc 5? Or a case that’s not a dedicated Arc 5 case but the shaver fits in it snugly? No worries, Wojtek. On the contrary, the comments section is there for precisely this type of insights. And it’s pretty clear that your technique works and can work for others as well. I always shave with my ES-LV65-S with the sensor turned off, but since the hairs on my neck grow in every possible direction and also lie flat on the skin, this makes little to no difference in my case, even when I lock the head. It’s not a big deal since I almost always shave daily, but a 3 days beard is a real pain. I’ve seen a few third party hard cases on Amazon for the Arc 3/Arc 4 and even for the first generation Arc 5, but none for the ES-LV65-S/ES-LV95-S from what I recall. Some of them may be able to accommodate it, but it would be best to ask the seller before ordering one. Thank you very much! That’s exactly what I needed to know. Thank you for your comment. The Series 9 cassettes in particular appear to wear out faster compared even to other Braun shavers (like the Series 7 or 5). I’ve been getting a few emails and comments from Series 9 users about this and other user reviews seem to indicate this as well. Even if they cost less than let’s say an Arc 5 foils + blades combo, it pretty much evens out if you need to replace them sooner. And having the blades and foils separated also makes cleaning easier, so I fully agree with you. I just got this shaver based on your review and the fact it was on sale $200 less than the Series 9 and the current Arc 5 ($250 at Shaver Shop in Australia). I also got a reasonably good deal on one set of replacement foils and blades from Amazon for USD$50 (I like to have the consumables handy for things like this). It is my first electric and it is mostly great – comfortable and close – but I found out I do get 5-10 black flat hairs that no matter what I do (all the directions, pushing much harder, etc.) this shaver won’t cut. And the fact it is so close otherwise and most of my beard is blonde makes them really stand out on my face. I’ve found that I have to take a Mach 3 and do a traditional shave every couple days to get them. The only good news there is that a light pass with the grain gets them so it isn’t like if before when I was just doing the shaves with that – but it still is disappointing. Many thanks for taking the time to share your experience. I actually have the same problem with the hairs that lie flat on my neck — and while Panasonic shavers usually get me a very close shave, they’re not particularly good with flat-lying hairs. 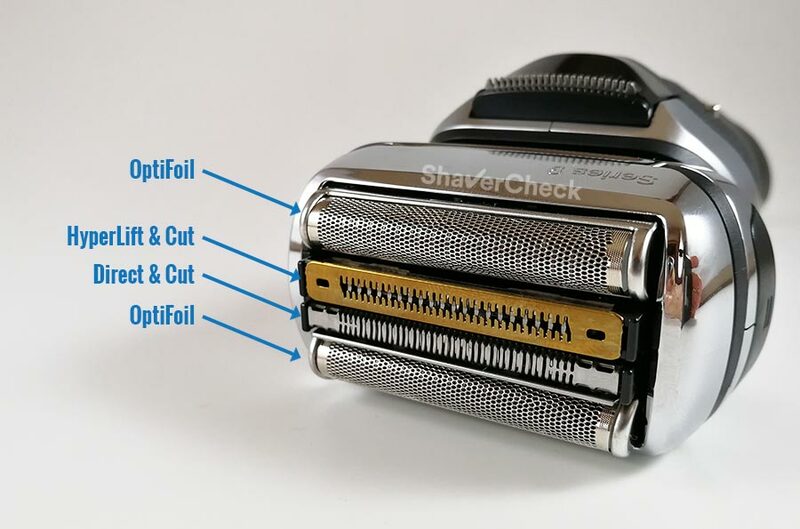 One workaround that is more convenient in my opinion than reaching for a razor blade is to use your shaver’s popup trimmer and gently go against the grain on those 5 – 10 stray hairs. 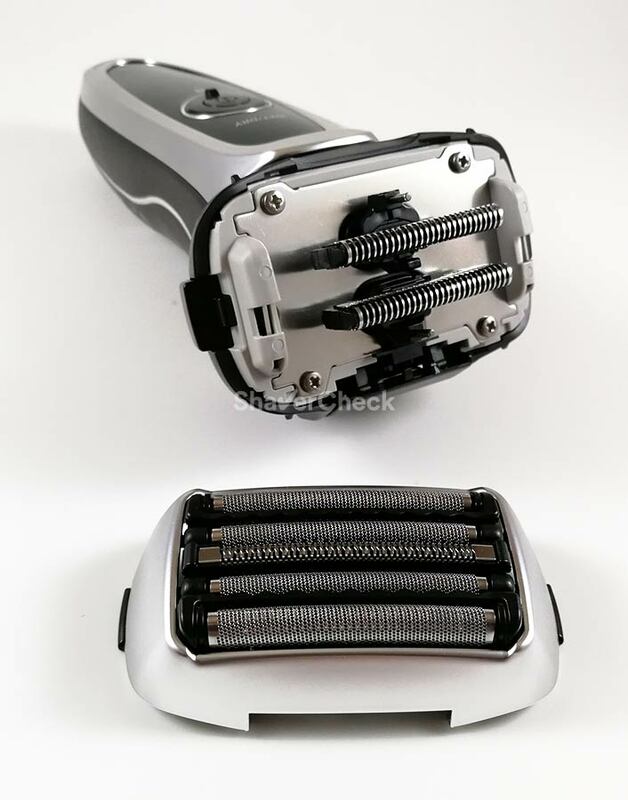 Normally it should take you only a few seconds to cut them, the trimmer on most Panasonic models is very good at this, including the one on your ES-LV65-S. Once you’ve done that you should be left with only some short stubble that the foils of your shaver will have no problem cutting. For me this works really well, so maybe give it a try. The Series 9 is superior in a situation like this one, but as you said it also has its own shortcomings. I’m currently trying the Panasonic ES-LF51 on their 60 day close shave money back guarantee. ShaverShop Australia is selling the ES-LV65 at a discounted price for $250 which is just $50 more than I paid for the ES-LF51. Is there enough of a performance gain in terms of closeness and speed of shave to justify going up to the Arc-5? I’ve found the ES-LF51 gives a decent shave but it could be better especially along the jaw-line under the ear. I do have a few flat lying hairs but I’ll try the trimmer tip you offered to a previous comment so that’s not a barrier to the Panasonic for me. The ES-LV65-S is a better shaver than the ES-LF51-A. It is more refined and more enjoyable to use, more comfortable (as long as you don’t press too hard) and you will likely get through a shave session faster. It also gives me a slightly closer shave on areas with very thick stubble like right below the nose. But regarding strictly the aspects you’ve mentioned (shaving along the jawline and below the ears) it won’t make that much of a difference. In my opinion it is worth the extra $50, but not really for those reasons. Thank you once again for being so thorough. I have enjoyed reading your posts, and (I think) I’ve narrowed the field of panasonic shavers somewhat in my search. As of now 🙂 , I am favoring a more advanced shaver and strongly considering comfort and closeness. Previously , I was thinking I preferred a smaller size shaving head….but I’m now wondering if I should focus more on the advantages offered by the newer 4 or 5 blade shavers. Specifically, I was considering the es lv65 vs the es lv9n or the es la63. As I watched, pricing on the lv65 went from $130 US to $155, with the lv9n running about twice as much. Is it worth the difference for the lv9n? And I haven’t excluded the es la63… at $95 the price is right, but I thought that the newer shavers sounded more refined and possibly offer a more comfortable shave, and that the shaving head size might be similar between the three. Do you have any experience with purchasing an open box item from ebay? I don’t mind the idea of a box being opened, but I definitely don’t want a used or refurbished shaver. Thanks again, you have already been a great help! Yes, you should oil your shaver after every cleaning that involves the use of soap. As I mentioned in the previous comment, clipper oil will work fine. I am not exactly sure that I understood correctly your second question — can you be a bit more specific? How do you usually wet shave in the shower or sink ? I personally never shave in the shower, but I do enjoy shaving with cream when using Panasonic shavers. For more details you can check out this article I wrote a while back. Thank you And one more question you can wash the trimmer under water to ? You are welcome, Nick. Absolutely, you can (and should) wash the trimmer as well. First of all, congratulations for your great site, thorough reviews and very informative articles. This is by far the best site I could find about electric shavers, amidst dozens of boring and useless “fake-review” sites filled with nothing more than rephrased press releases. My question now: I’ve just asked for a Panasonic ES-LV65 as my birthday present; do you know if a charging stand is available for this model, or if I can use a stand designed for another model such as this one: https://www.shavers.co.uk/electric-shaving/spare-parts-accessories/panasonic-weslt6nk7188-charging-stand.html ? Regarding your question, the charging stand is only available with the new Arc 3 models. However, since the charging port on those and the one on the ES-LV65-S is the same, the stand should work with the latter as well. 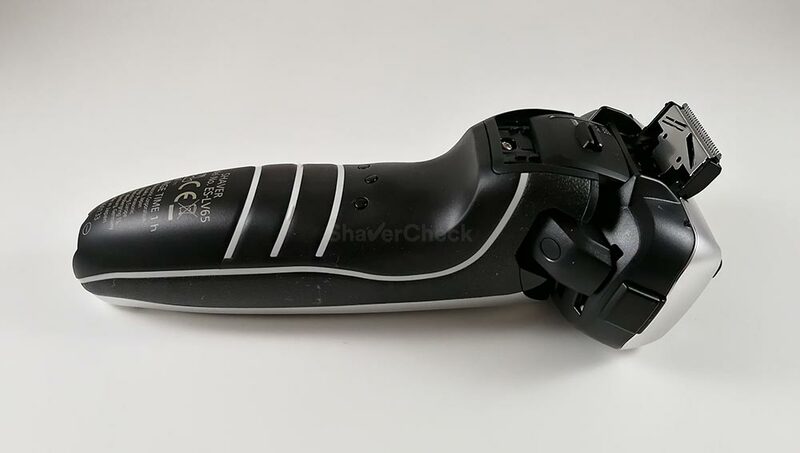 Unfortunately I do not have a Panasonic charging stand so I cannot confirm that it will 100% work with the ES-LV65-S. My only concern would be the concave area around the connector and the positioning of the charging port on the shaver that may not allow it to stand upright. If any reader can test the LV65/Arc 3 stand combination, that would be much appreciated. I’ll try and ask Panasonic themselves, but I don’t expect any useful answer. I currently own a Braun Series 5 5040 electric shaver. I’ve had it for over a year and can get fairly decent shaves most of the time. I find that when using the wet element, either through foam or gel, I get a couple of nicks; I alternate as a result between dry electric shaving and wet electric shaving. My skin feels smooth, but I can see some stubble in some parts such as my moustache and just below my chin, so whilst it is gets the majority of hair, it does not also get all. I wanted to know whether it is worth me investing in the ES- LV65. I can currently get it for £100, which is slightly more than the Series 5 I purchased in January 2017. Will it improve my shaving experience more than what I currently have? I have fairly normal skin where I shave, getting the old ingrown hair or bump. Will the ES-LV65 provide a longer more fresh looking shave, as I have found that when shaving with the Braun daily, my moustache and chin have started to almost have a permanent 5′ clock shadow, whilst my cheeks have a relatively closer shave. Thanks in advance for your reply, and apologies for the long message, but I’ve started to develop a big interest in shaving :). Having used both a Series 5 and the ES-LV65-S, the latter gives me a closer shave, particularly when used with a high-quality shaving cream applied in a very thin and slick layer. I can relate to you as I have very thick stubble on my moustache and chin and that’s where most electric shavers fail to give me a very close shave, including the Series 5. The ES-LV65-S is one of the best I’ve used in terms of closeness. But again, I am able to achieve that when shaving wet. A dry shave with the Arc 5 is not as good in my case as I have very sensitive skin. The Arc 5 would be a worthy upgrade in my opinion if you’ll stick mainly to shaving daily (it’s not great with longer hairs) and you’re not against using shaving cream with an electric shaver. In my experience this is where the Arc 5 shines. But you may be able to get better results than me during a dry shave as well. Would you say the Arc 5 and Series 9 are the ones to compare, rather than the series 5 and Arc 5? If so why is there such a massive price difference between the braun and Panasonic? Is Braun just over priced? Absolutely, the Arc 5 and Series 9 are the ones to compare. The ES-LV65-S is an older model (the second generation Arc 5), hence the lower price. The latest (third generation) Arc 5 models are significantly more expensive. Are the newer models worth looking at? Or are they the same but just with cleaning stations? I’d say no, at least not at this moment. For the current price, they don’t bring a significant performance boost compared to the previous generation. The new cleaning stations have different part numbers, but are basically the same as the one that comes with the ES-LV95-S.
Hi Ovidiu, just noticed in the ESLV65 manual, it states that the life of the rechargeable battery is three years. Of course, actual battery life will depend on many factors, but three years sounds quite low to me. How have you found panasonic batteries to last in the past? How do they compare to braun? I never had a Panasonic shaver that only lasted 3 years. In fact, the battery on my oldest pre-Arc shavers lasted for 6 to 7 years before it could no longer hold a decent charge. With that said, I do find Braun shavers to be slightly better in this regard. I usually get more shaves out of a fully charged Series 7 compared to an Arc 5 for example and they also seem to degrade slower. However, this was merely my experience and things could be different in other cases. I wouldn’t worry too much about the lifespan of the battery in the ES-LV65-S; unless you’re very unlucky (batteries are not covered by the warranty), it should last for many years given proper care (see tip number 5). Interesting, thanks for your reply. Absolutely. Just one thing to keep in mind, after a battery swap I personally wouldn’t consider that particular shaver to be completely waterproof and I probably wouldn’t submerge it in water or use it in the shower anymore. First of all I would like to thank you for detailed reviews, they are the best in the entire internet. Could you give me your valuable opinion on buying whether the ES-LA63-S803 or the 5190cc as they are both similarly priced in my country ( actually the panny is 5$ cheaper). It will be my first electric shaver and Im planning to shave on every working day. I have a problematic area on my neck which gives me rashes when I shave every day, thank you. Thank you for the kind words. Between those two models I think you should go for the 5190cc. In my experience the Series 5 is more comfortable and more forgiving compared to the Arc 4 from Panasonic, especially during a dry shave. Panasonic shavers can often be a bit too aggressive if you have sensitive skin; I think you would benefit more from using the Series 5. Correction: The correct model name is Panasonic ES-LV63-S803. Oh my, typed it wrong again. The ES-LV65-S is a bit more gentle than the ES-LA63-S and gets less hot, but it’s still not as comfortable as the Series 5. I’ll take valuable advice and will go for the 5190cc instead of the ES-LV65-S803. So a very positive feeling all around. Thanks again for this review, which convinced me to try this model in the first place. That is awesome! Thank you for the detailed follow-up, glad to hear the ES-LV65-S was the right choice. Thanks very much for your very informative articles. They are the most honest and useful reviews on electric shavers that I have found on the internet and have made choosing a new shaver a much easier task! I have the ES-LV65 (with no S) – Australian market. Can you tell me what the difference is between this and the S model? Also, I understand there are several Arc5 models and any of the foils for the 5 head models are suitable for the ES-LV65 (maybe with the exception of the very latest models released recently). This gets a little confusing when searching around and comparing prices as there are around half a dozen different foils which can be used. Are you able to provide a definitive list of the WESxxxx model numbers which are suitable for use on the ES-LV65? That’s a great question and the short answer is that all the new Arc 5 foils will fit the older ES-LV65-S and ES-LV95-S models. Speaking of which, the -S in the model name is often left out, but there’s absolutely no difference between an -S and a non-S model. With that said, here are the part numbers of the foils that will fit your shaver: WES9175 (found on the third generation Arc 5 revision A and B), WES9177 (found on the latest revision C and D Arc 5 models). You can buy just the foils or the inner blades + foil combos, they will still fit just fine. Thanks for an excellent and thorough review. I’m sold. I have an old Braun Series ?? (don’t remember model number) which the charging and cleaning base is starting to frustrate me. The unit charges but doesn’t recognize a new cleaning cartridge. There are some suggestions on youtube that tries to fix this but to no avail, at least for me. With Black Friday coming up, I’ve seen the Arc 5 ES-LV65-S on sale for $99.99 (Amazon and Best Buy). To me, that’s a no brainer. Save $100 and no more cleaning cartridges. Thank you for your comment. That sounds like a plan — the ES-LV65-S is a fantastic shaver, especially for that price. 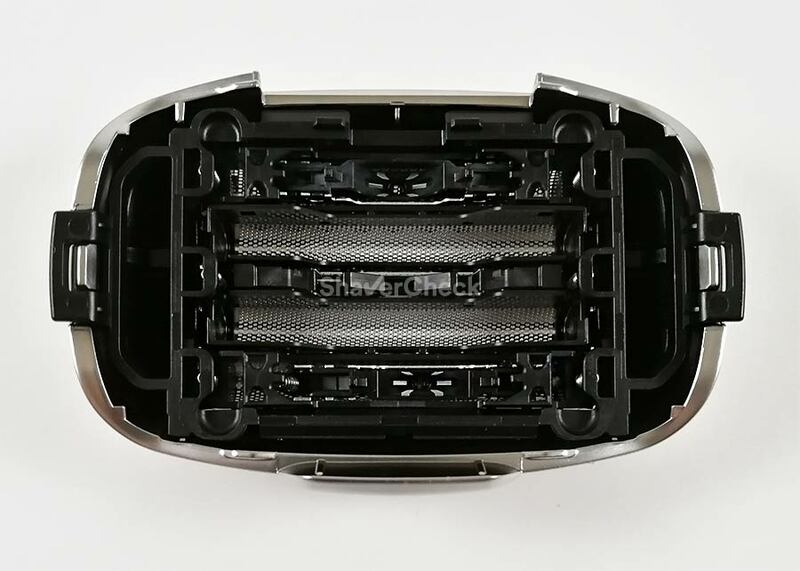 I’m wondering do the replacement Men’s 5-Blade Shaver Foil and Blade Set – WES9034P that are used for the Panasonic ES-LV9N-S be used for a replacement for the Panasonic Arc 5 ES-LV65-S? Yes, the WES9034P will work perfectly fine on the ES-LV65-S.
Wow! What a great website. I could read it for hours (oops, I just did!). Thank you for your comment, Raffaello. I really appreciate it. I’m glad you found the information useful. Thanks for your amazingly useful site! 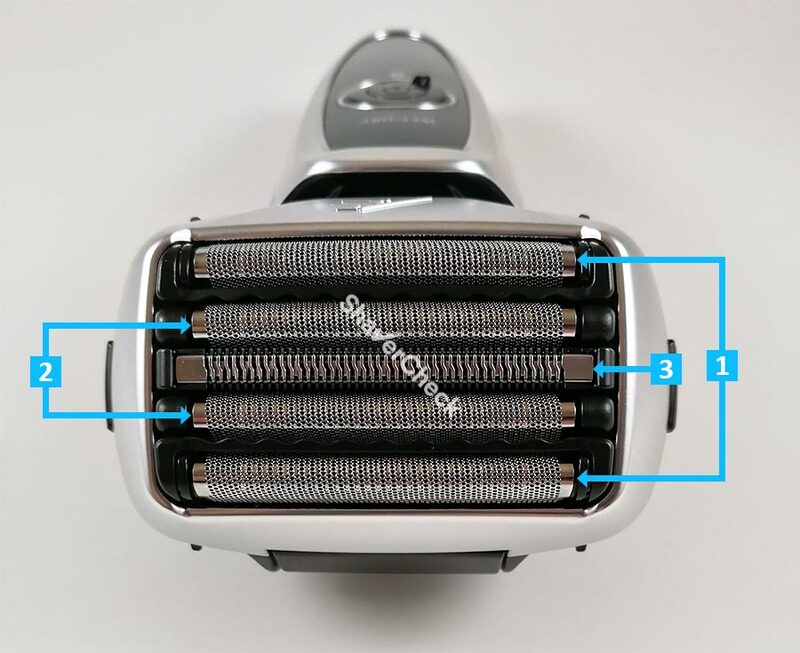 I’ve seen so many shaver blogs that were just copy-and-paste link farms that I was shocked to discover such a meticulously researched, knowledgable, and informative resource. I just ordered an ES-LV65-S based on your reviews. I’m replacing something that looks like it’s been dragged behind a car: a Norelco 6886XL that I’ve used for over 20 years. I replaced the battery once, and believe it or not, the blades only once too (! ), and I only clean it when it’s time to recharge. It still works quite well for my 3 or 4 shaves a week, but pieces are starting to fall off, like the little button that opens the head for cleaning. The higher end of the current Philips line are too expensive compared to the current deals on foil shavers, and that, combined with all the reviews I’ve been reading have convinced me that it’s time to try foil. I was about to order a Braun Series 9 9290cc (which with an instant coupon and a rebate would be $150 on Amazon now), and I think the Braun might be a *bit* better shaving experience for me than the Panasonic, but in the end I couldn’t get my head around the idea of needing a little washing machine just for my shaver. The easy cleaning (and the current $100 price tag) sold me on the Panasonic. Thank you so much for taking the time to comment. I truly appreciate your kind words and I am humbled whenever I hear that my reviews actually helped someone and hopefully made the tiniest difference to their everyday life. I am indeed Romanian (great observation) and even though I was born in the late ’80s, I know very well how things used to be during that time. You actually summarized everything perfectly — beautiful people, sad times. I have finally chosen my main electric shaver and its the Panasonic ES-L65-s. I also brought the WES9034P. With the Neutrogena shaving creamn for sensitive skin I get a real close shave. I dont bother using my Braun Series 9 9295cc anymore, I wish I can sell it or trade it in. That’s great, Melvin! In my opinion that is an ideal combination. I think you should try selling your 9295cc, I’ve seen many pre-owned Series 9 being listed on ebay. What do you think about that model? 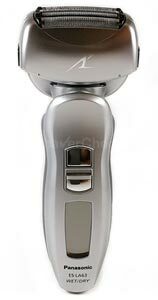 I would try to get one of the more powerful four-blade Panasonic shavers, like the ES-LA63-S or ES-LF51-A. The ES-RF31-S has a 10000 CPM motor, while the more powerful models are fitted with 14000 CPM units. The difference between them and the ES-RF31-S is noticeable. I’m going to give you an opinion. Before I gave my opinion, I saw a comment that you had communicated with others. It’s about charging stand. And as I tested it, it works perfectly in the arc5 “LV” series (I’ve tested it on LV65 and LV5C, and it’s going to be fully compatible with the “LV” series), and stand very well. When I wrote a review of ES-LV5C on my blog, I also looked up many Japanese models. Japan also has an Arc5 “CSV” series, which includes a charging stand. The charging stand’s model name is not the same, but the charging terminals are all the same, so I think it’s all the same. I use WESST3NK9188 (ES-ST3N-K accessories). Are there some models in Arc3 “LT” series with charging stand? The name of the charge stand is WESLT5NK7188. The model name of the charging stand is W(model name)7188. Charging stand are available at service centers in all countries (about $8). I told Korean about this and many people bought it. Your review is perfect now, but I think it’ll be better if you give the people who want to buy this electric shaver another option. I got a lot of help from your homepage, and I hope to share my opinion that I will get help from your homepage in the future! P.S. If you want, I can give you my photo. I am sorry about replying so late, somehow I didn’t get notified about your comment. Thank you for the heads up about the charging stand. Here in Europe there’s the ES-LT6N-S Arc 3 that comes with a charging stand. It may be available under a different name as well (in the USA it’s called ES-LT5N-H). You can send me the photo at contact@shavercheck.com, I would really appreciate it. I just wanted to thank you for the effort you put into this. Your website must be the best place for anybody looking to buy a shaver. It’s not easy know which model to buy and what to look for on the market but you made the whole process a lot easier. Your reviews are thorough and focus on the important features of the product. After using entry level Philips shaver for many years I decided to invest in a more expensive razor. I chose ES-LV65-S and a few shaves later I am truly impressed. It gives an incredibly close shave. Granted, it’s still a honeymoon phase but I am confident that my satisfaction with this product will only grow. Thank you for your kind words and for taking the time to share your experience. Glad to hear you’re satisfied with your new ES-LV65-S, it really is a fantastic shaver. I had to try all 4 shavers for myself. Lol. Notelco prestige, arc 5 and Braun 7 and Braun 9. Your reviews are spot on and the arc 5 after 1 day of testing shaves the closest. Norelco prestige shaved close but what a pain to do and so much longer. I have a question: the arc 5 head is big and on my first try I was not sure what is best on shaving the upper lift. Do I just use one foil or am I suppose to run the entire head up down , left and right and angular? I am not sure which arc 5 I bought and will have to check but it had no cleaning station. I still have to spend more time testing but I think the arc 5 is the winner. Finally a fast shave and good bye to my Gillette fusion. Closeness I rate as follows so far. When shaving above the upper lip with the Arc 5, try using only the first two foils (from the top) and use short, up and down strokes. You should also lock the head in the fixed position. This is how I do it and at least for me it works really well and the size of the head isn’t that big of an issue anymore. Thank you very much for your tests and reviews. I do have an old Braun 5, and i was considering « upgrading » for a new Braun 9 or Panasonic Arc5. Like everybody i want a very close shave but i want it easy to clean without a cleaning station that take to much room…. So it seems that Braun 9 is discalified cause of this « foil/cutter black box cartrage » no that easy to clean without the station. So i arrive to the Panasonic …. i would have like it just waterproof like some of the Braun to be able to use it uncharged without waiting but batteries last, and as i dry shave i hope that my skin won’t be irritated. 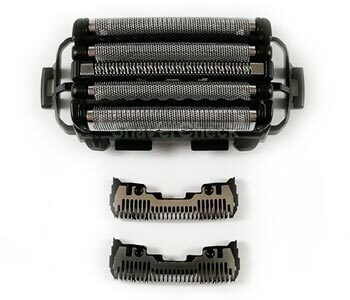 So i wanted to know, if with wathever Arc5 es-lv 61/65, you can just replace the foil/blades with the last one with the 2 skincare rollers like the 6N/6Q? Is everything compatible? Then, i’ve noticed that the main evolution between the 3 Arc5 versions is in the metal finish and with the multiflex head, that started with 2D then 3D up to 5D now. But is is worth it? 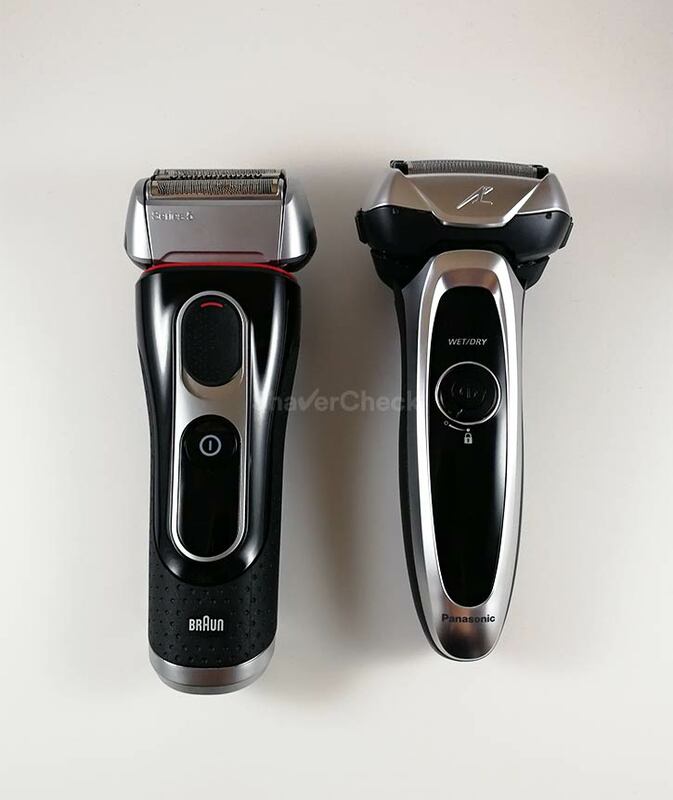 And to finish, i was wondering if i will get use to the different way of holding the shaver vs the Braun, so i was wondering if the es-cv51 wouldn’t be a good choise …. but no flex…. Yes, the newer foils and blades found on the third generation Arc 5 are compatible with the ES-LV65-S. Compared to the older ones, they are more comfortable, while the closeness seemed pretty much the same to me. 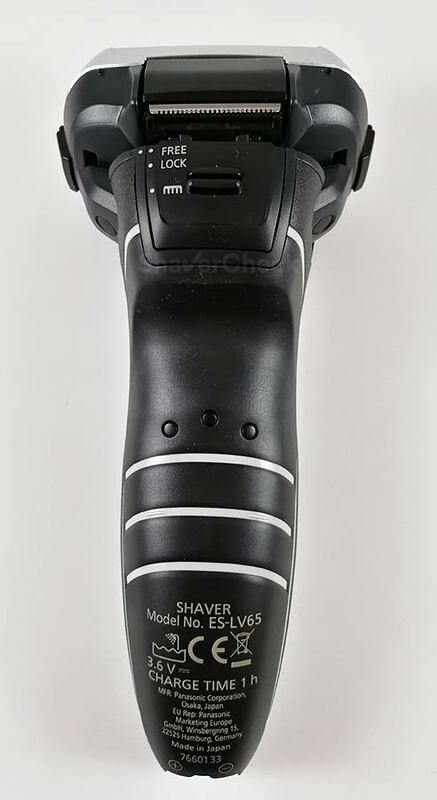 In my opinion the latest Arc 5 shavers are not worth buying yet, especially since the ES-LV65-S/ES-LV95-S can be had for significantly less money and the performance enhancements brought by the newer models are marginal. I personally don’t care too much about the super flexible 5D heads, I found them just wobbly and annoying and I prefer to shave with the switch in the locked position. So from my point of you, the ES-CV51 is not really that much different. I’ve reviewed it and I think it’s a really good shaver. But again, you simply can’t beat the ES-LV65-S with regards to value for money. That one would still be my pick. I just picked up the ES-LV65-S after some disappointment with bothe the Braun Series 3 & Series 5. I haven’t tried the BS-7 or the BS-9 but this particular Panasonic really leaves both the BS-3 & 5 in the dust! I was a bit concerned with the size of the shaving head due to the 5 cutter configuration but it turned out to be a non issue. I also tried the Panasonic ES-8243 & while it’s a respectable shaver I had the sense that if it ever quit working I probably wouldn’t replace it. I feel exactly the opposite about the ES-LV65-S. I’m not sure I would ever want to be without it. Thanks for all your reviews because it definitely helped guide me to the best choice. Thank you for your comment, Devan. Glad you found the review useful. I am definitely with you on this one, the ES-LV65-S is in a different league compared to the Series 3 and even the Series 5 from Braun. Right now it’s arguably the best electric shaver out there with regards to performance and price. And the fact that you can use the newer foils & blades of the latest Arc 5 generation is yet another reason to consider it for the long run. Your site has been very helpful while I was looking for a first electric razor for my teen son and a new razor for me to replace a decade old Braun Series 5. I settled on the ES-LF51A for my son and couldn’t pass up the ES-LV65-S for me on sale for $120. I just used the ES-LV65-S today for its initial use. I opted to try a wet shave for the first time with an electric razor, and I have to say the LV65 with Cremo Original shaving cream resulted in a shave that was virtually indistinguishable from my typical Mach 5 bladed shave. It was light years better than my old Braun. And that is coming from someone with a very dense beard growth. I’m the type of guy that has a 5 o’clock shadow by noon. I would definitely recommend the ES-LV65-S to anyone, especially when it is on sale. On a side note, it appears the razor no longer comes with a cleaning brush and oil. Not sure if this a recent change, but you only get the soft travel case as the included accessory. Thank you for your comment, Lee. That’s awesome, glad to hear you’re satisfied with the performance of your new shaver. Regarding the accessories that come with the ES-LV65-S, I bought my unit from Europe a while ago, so I do not know whether this has something to do with. I will try to find out more about this and update the review accordingly. Thanks for your website. I’ve found the information very helpful in finding the right shaver. After many years using Norelcos, after the 4500 I was using would no longer hold a charge, I tried several shavers and wound up with the ES-LV65-S. I get good results with little to no irritation dry-shaving before showering. I had to learn to shave my neck mostly laterally to get a close shave there; direction was not an issue with rotaries. Oiling the shaver with Wahl clipper oil greatly reduced irritation. It’s nice to know I can get the more comfortable newer blades when it’s time to replace them, or sooner if I want. I purchased in the US, and no oil or brush were included, just the charger, the cap and the soft travel case. I paid about $120. In the US, the only 3rd generation Arc 5 available through normal retail channels is the Revision A ES-LV9N for $300. 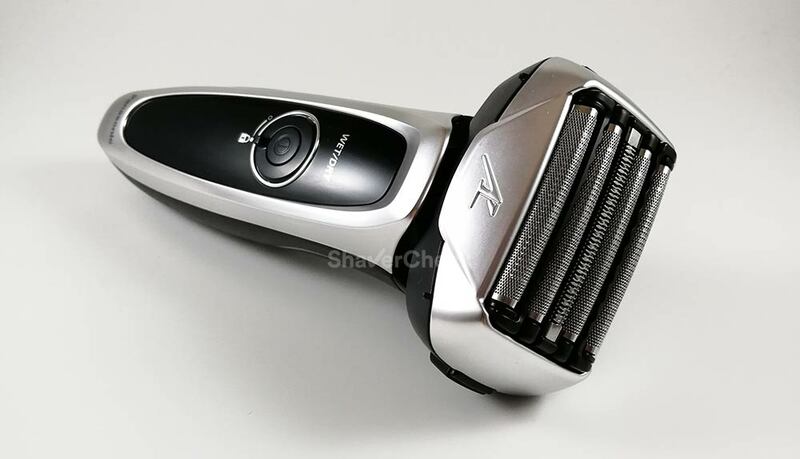 I didn’t want to deal with possible warranty problems by getting a revision C or D shaver through a foreign seller, which would also be at a high price. A Braun series 7, which worked well, but I had to return because 1) I am sensitive to scents and cannot tolerate the cleaning station solution, and a Braun agent told me manual cleaning would not be complete, 2) The vibrations in my hand were annoying. Another 4500. After the Braun it wasn’t close enough. An expensive Norelco Prestige, without qi charging. It looks great, and I never had any problem with manual quick daily or thorough monthly cleaning of that or other Norelcos. It shaved reasonably closely, but it was too irritating. I didn’t try oiling it. Thank you for your comment, Steve. I really appreciate you took the time to share your experience in such a detailed manner. I think you made the right decision by going with the ES-LV65-S, I still think it’s currently the best Arc 5 variation you can get, especially in the USA. Thank you very much for your Reviews. I have always been a Phillips user and am very disappointed with the replacement heads. 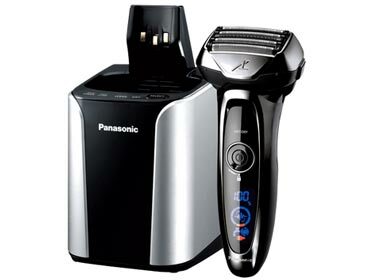 Although I have not used a foil shaver, after reading your reviews, I think I will get the Panasonic ES-LV95-S. I think I will get the version without the automatic cleaner. Can you tell me how often you need to manually clean the Panasonic? I have light, non-oily hair that is turned mostly gray. Also, what is the best oil to use on the blades? Also, any recommendations for converting to a foil shaver? A quick rinse with warm tap water after every use will be good enough in order to remove most of the hairs. Every once in a while you should also use a bit of liquid soap for a more thorough cleaning. Wahl clipper oil works great and it’s also inexpensive, so I highly recommend it. 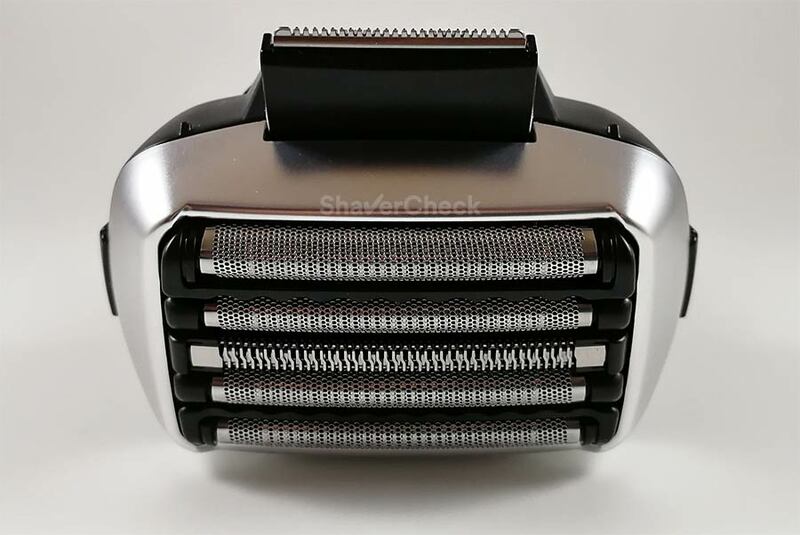 When switching from a rotary to a foil shaver, make sure to always shave against the grain using short, controlled, straight strokes, holding the shaver at a 90 degrees angle relative to your face. Use your free hand to keep the skin taut and do not apply excessive pressure. Also, most foil shavers work best on shorter facial hair, especially if you have lots of flat-lying hairs that grow in different directions. Thanks Ovidiu. One further question. From the perspective of avoiding bacterial contamination, is there a rinsing fluid or solution that you would recommend? Is there any reason not to rinse the heads in an alcohol solution to facilitate drying? You are welcome, Mitchell. Regular soap is actually very effective at this as it kills most bacteria/fungi. I wouldn’t use an alcohol-based solution as it can be very aggressive to plastic and paint, especially isopropyl alcohol. And Panasonic shaving heads were definitely not designed to withstand constant exposure to alcohol. The best approach would be to clean it regularly with water and a bit of liquid soap. One last question. 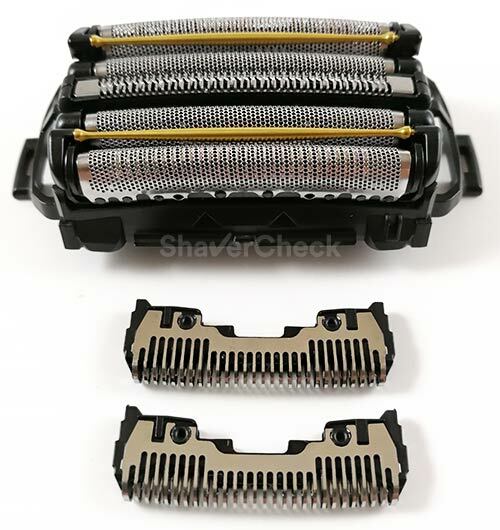 Is the ES-LV65-S the same shaver as the LV95-S? In this case the ES-LV65-S should work really well. It is clearly superior to the Series 3 as far as shaving performance is concerned and you’ll most likely notice a significant improvement in closeness and speed. The Series 9 works better on longer, flat-lying hairs, but for shaving daily a coarse beard I would go with the Arc 5. It also shaves closer than the Series 9. Thank you for your comment, Rick. Glad to hear your Arc 5 is up to the expectations. First of all thank you for some very cool and informative reviews. Besides this review I have read your review on the Braun S9 and as you and others have mentioned there are drawbacks on both models however maybe you can help clarify some of my concerns? Usually I shave every day or every other day but some times it happens that I dont shave in 3 days, so which shaver would you recommend for this inconsistent shaving? As I understand you the Panasonic ES-LV65-S is better for every day use, were the Braun S9 is better when you haven’t shaved for severall days. How significant is the difference? At the moment I have an old Braun S7 but I am thinking of changing to the Panasonic and one of the reasons is that I would like to use the wet/dry function once in while. However usually I would use the dry function so which one would you recommend in that case? How is the best way to get rid of the flat lying hairs with the Es-LV65-S and does it really make a huge difference compared to the Braun S9? Considering the price of the 2 different shavers and the other things mentioned which one would you recommend? Have In mind that it would be nice to have a cleaning station but it is absolutely not essential for me. I will try to answer each of your questions and hopefully help you decide which one to buy. Your statement is correct, the Arc 5 (and Panasonic shavers in general) work better on short hair, so using it daily and every other day would be ideal. Regarding the performance on a three days beard, that of course will vary from person to person as it depends on how fast the hair grows, if it has different grains and most importantly how many of them lie flat on the skin. But again, if most of the time you’ll be shaving daily or every other day, the Panny would still make sense. The Series 9 will make it easier for you to get those difficult hair strands with fewer strokes. And with greater comfort, that’s another aspect you should keep in mind. You didn’t mention your skin being sensitive, so I simply assumed that it is not, in which case both shavers are viable options. The Panasonic is unbeatable for closeness and for shaving short, dense hairs fast and effortless. The Series 9 is very comfortable and more capable at shaving long and flat hairs, but doesn’t shave as close as the Arc 5. If you’re only getting the ES-LV65-S to use it with shaving cream, there are also wet/dry Series 9 models available if you think the S9 would make more sense in your case. I would get the Series 9 with a cleaning station, even if I were to use it like 4 times a month. 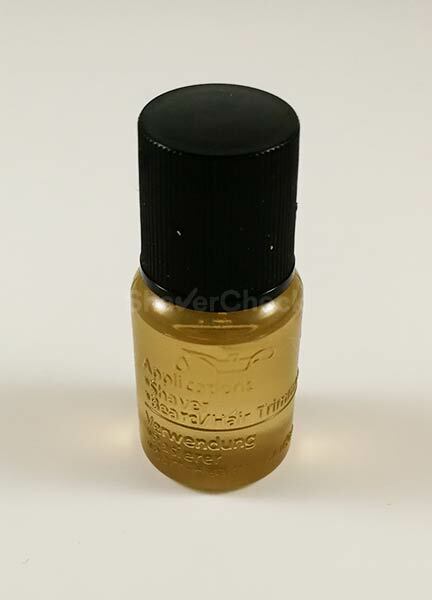 It’s very easy and convenient to remove the cartridge, put the cap back and store them until needed. You can simply clean it manually in the meantime. The cc Series 9 models cost only marginally more than the solo models and you can find very cheap third-party cleaning solutions (they work really well). As for the Panasonic, I would stick with the ES-LV65-S and not get the ES-LV95-S that comes with the station. I have a few Panasonic stations lying around, never felt the need to use them, especially since they don’t have removable cartridges with caps. Once I mix the detergent with water in the tray, I’m stuck with it. The ES-LV65-S is very easy to clean manually and quite a bit cheaper than the LV95. The price is usually lower for the Panasonic, particularly the ES-LV65-S which can sometimes be found at some incredible deals. And even the ES-LV95-S is usually cheaper than a solo Series 9. So price-wise the Arc 5 fares better, but in different countries it may be the other way around. I noticed that the Panasonic WES9034P replacement blades is out of stock at http://www.panasonic.com. I found a similar blade called the Panasonic ES9036 on Amazon but the sellers are located in Japan. I’m wondering are these blades legit or counterfeit. I’m pretty sure they are legit. The ES9036 is a newer iteration (but very similar to the WES9034P) and it’s the foil & blades set used by the latest Arc 5 generation 3 (revisions C and D). I will buy it and see how it goes.